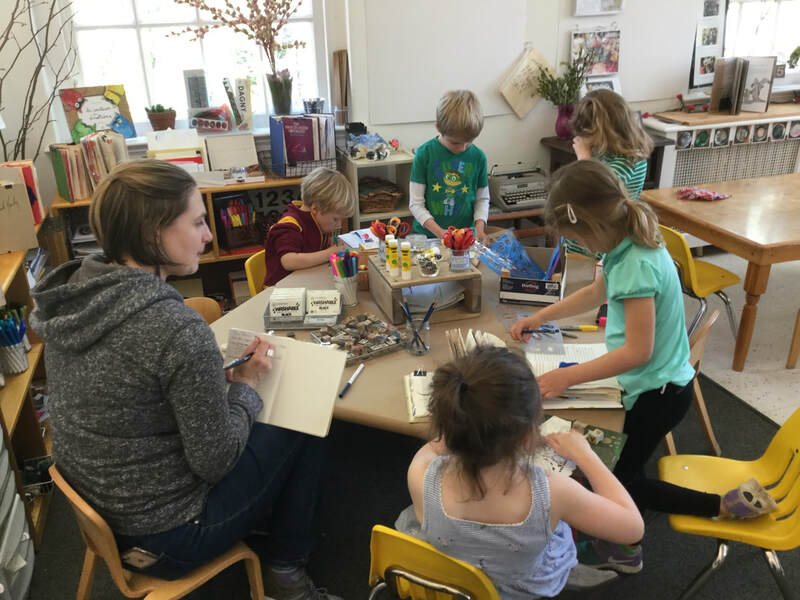 While it was the end of a busy week at St. John's and the start of a holiday weekend, children were both excited and focused in their work this afternoon. We found most children worked with the two main experiences for today: Wire/ Wood Workshop and Art Journaling. We started the time together outside enjoying the weather before it turned to rain. This was followed by an Easter story inside, and lunch before digging into our workshops. ​This is where the real focused fun began! 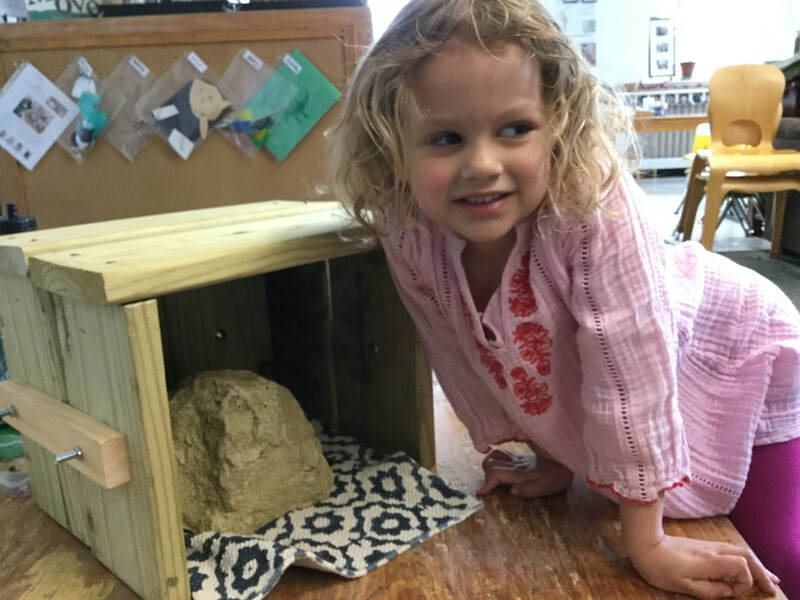 There was so much interest in working with wood, wire, and beads this afternoon that a few children built their base and added wire and beads to it. The No-Touch-Wire challenge continued as children used fine-motor manipulation and cognitive planning to create with the wire in a way that the beads would not touch one another. 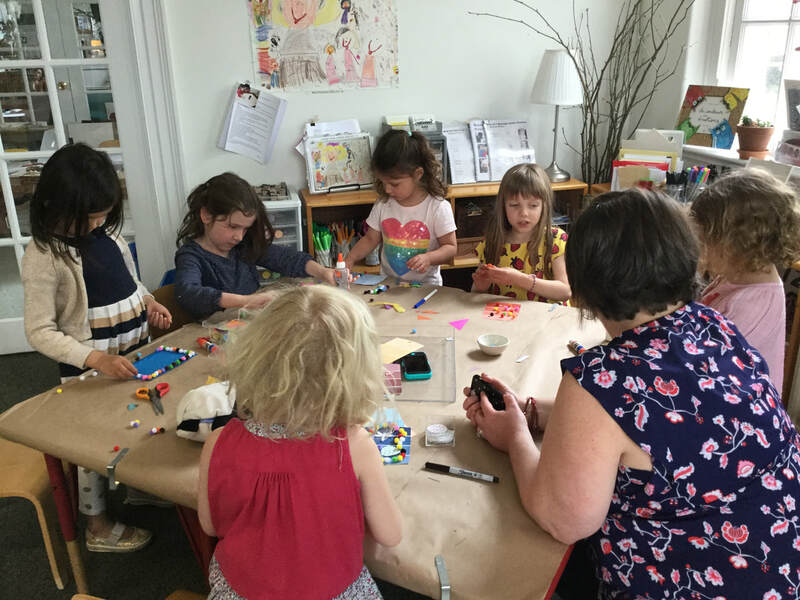 Children used a variety of materials such as traditional beads, clay beads they had made earlier in the year, and fabric to name just a few chosen today. 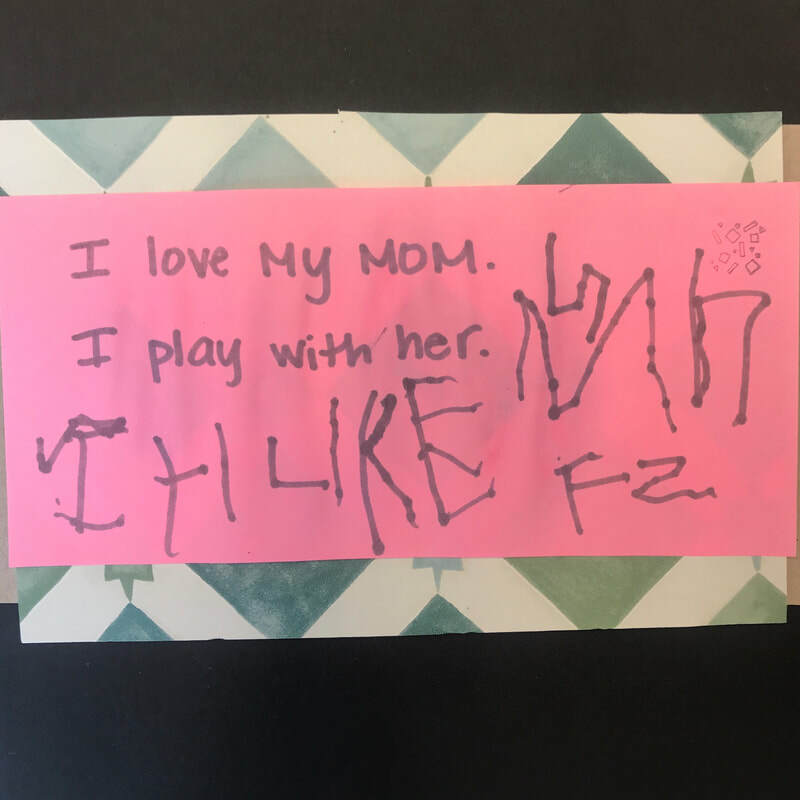 While working with the wire, children shared some of their thoughts showing once again how the children build off of one another's ideas and come up with solutions to problems. Tommy: "This is a crazy loop. This is a magnifying glass." James: "I did the same thing as Tommy." 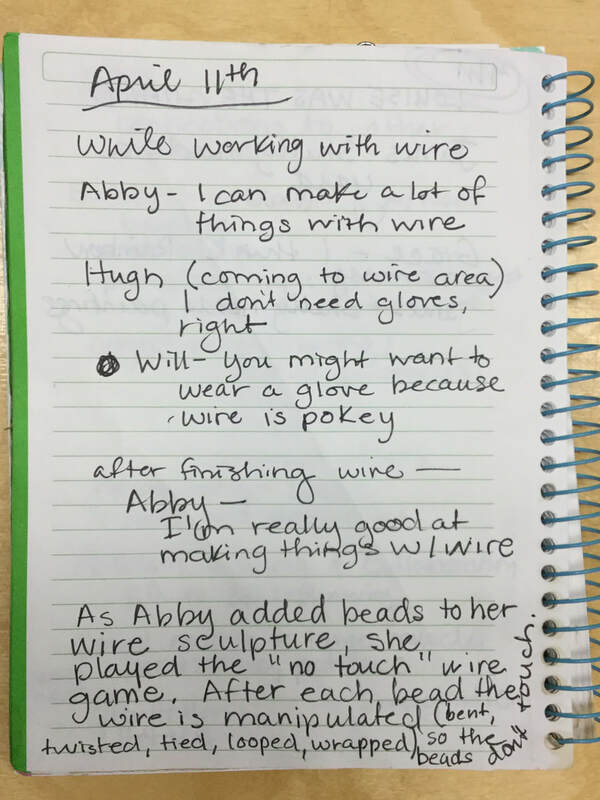 Abby (indicating her understanding about how to strengthen flimsy wire): "I know, I'll twist it." Abby (With her new wire creation, speaking for it): "'I'm a wire human. I'm a dragon.'" Dagny, inspired by Abby's idea, twists her wire together. .As we did yesterday, we challenged the children with the Dice Game. What appears to be most difficult about this game is following through on a few consectutive steps/rolls and doing so on just one page in their journal. Some children default to turning the page after completing a step and others want to stop playing the game after just one or two steps. As we have given the children many opportunities to work at their own direction in the journals, we also see there is value in having to follow-through on layering with the random choice of the dice. With encouragement, the children stuck with it. 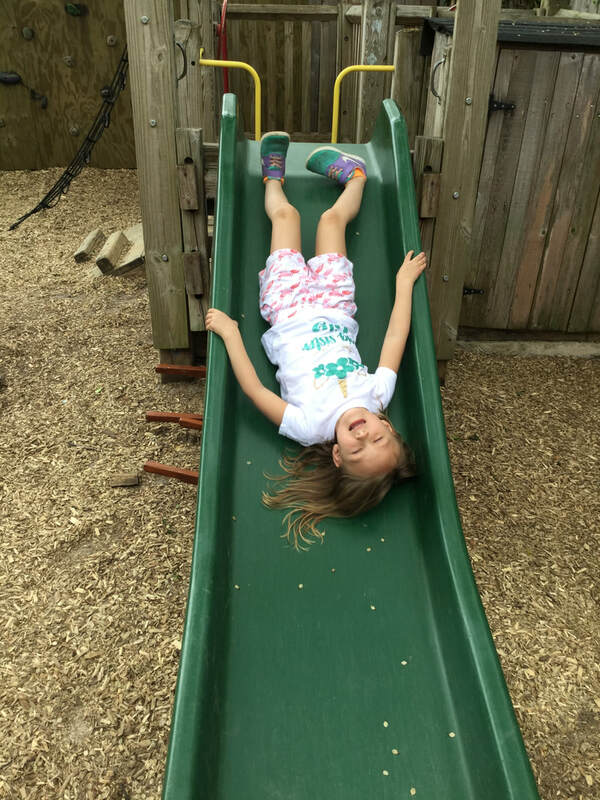 What seems to be happening for many children is after they have completed step three or four, they suddenly start embracing the challenge of the game as well as appear to have many of their own new ideas they want to try. Both yesterday and today children combined some of the steps in interesting ways as well came up with innovative ways of thinking about a step. For instance, upon seeing the roll "tear and glue," James tore the edge of a page straight off and then glued it to another page. Hugh liked this idea and tried it as well. Cate added a miniature book to one of her pages and Lily seemed to get everyone excited when she announced, "I'm going to add something from my pocket." 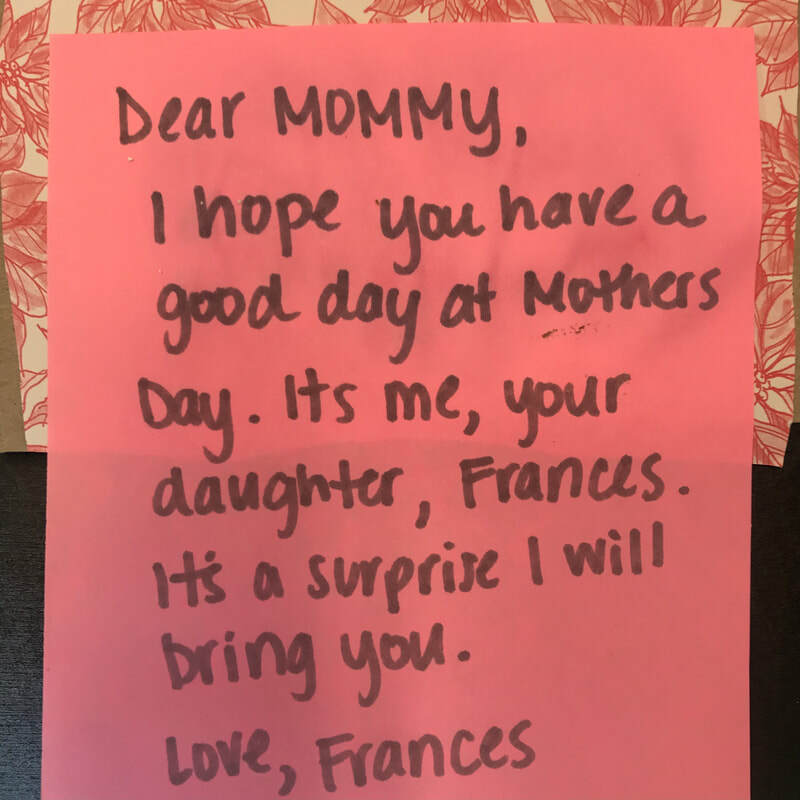 The other children quickly looked to see what they had forgotten was placed inside their journal pockets. Also interesting is the way some children who usually prefer some sort of direction/starting point are embracing letting go and exploring the process more freely such as Will who opted out of the game today but worked on several pages. He even thought about his cover. 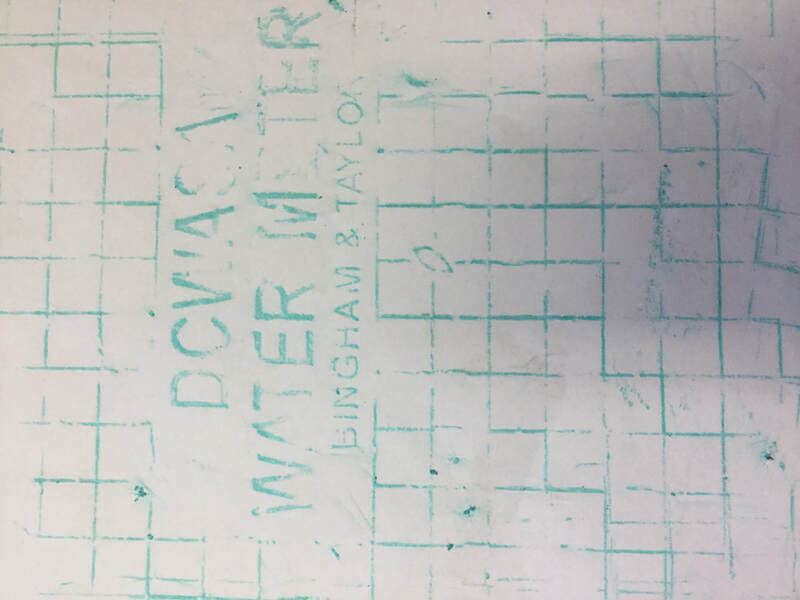 After walking around the art journaling table for a bit, looking at tools and materials, Will wondered, "Is it OK to stencil on here (my cover)?" After the game was finished for today, several children did some free art journaling. 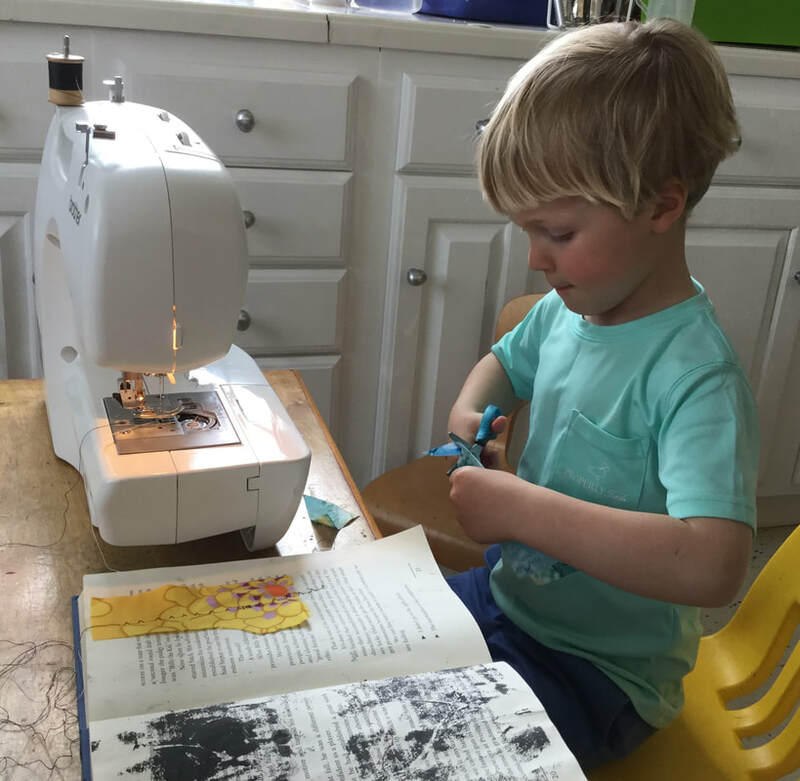 Lily, Hugh, and James used the sewing machine to sew together some ephemera for their journals. Why are we doing all these challenges? Will wondered why we are doing so many "challenges" in KW these days. Today and recently we've been talking so much about the capability of the children and how we don't want the work to be too easy that it isn't interesting. We know they can rise to the challenges presented for them and have been making a game out of it. 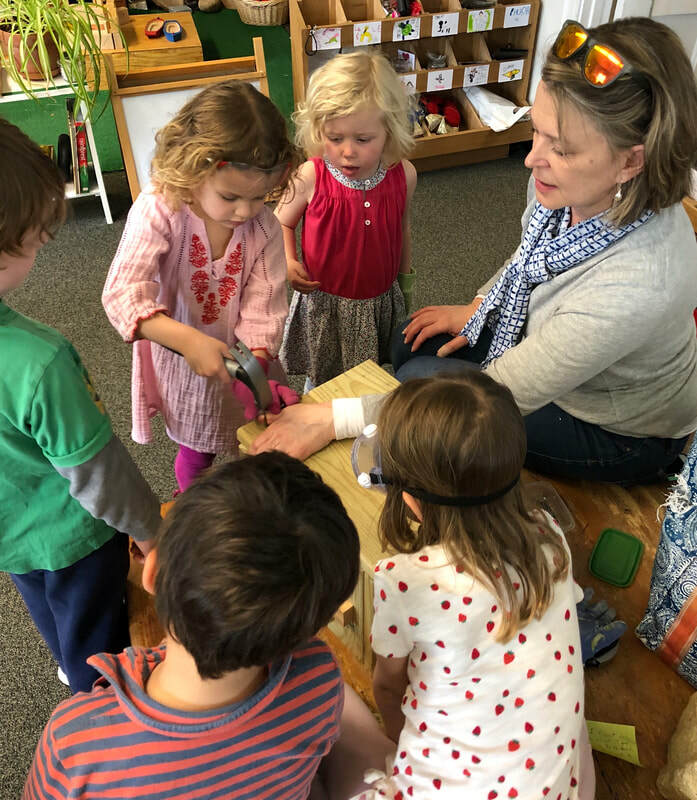 Many times through these discussions we reflect on what the children could do at the beginning of the year, last year, and when they began at St. John's in the Brown Room. So responding to these ideas today, Will said, "If we did something in Tucker Room that we did in Brown Room, we would be excellent at it." Children continued their sculptures today as they twisted, bent, and looped wire, often attaching it to a wood base. While Maisie was manipulating her wire, she realized that she would like a base for it, and took time to pound one together. 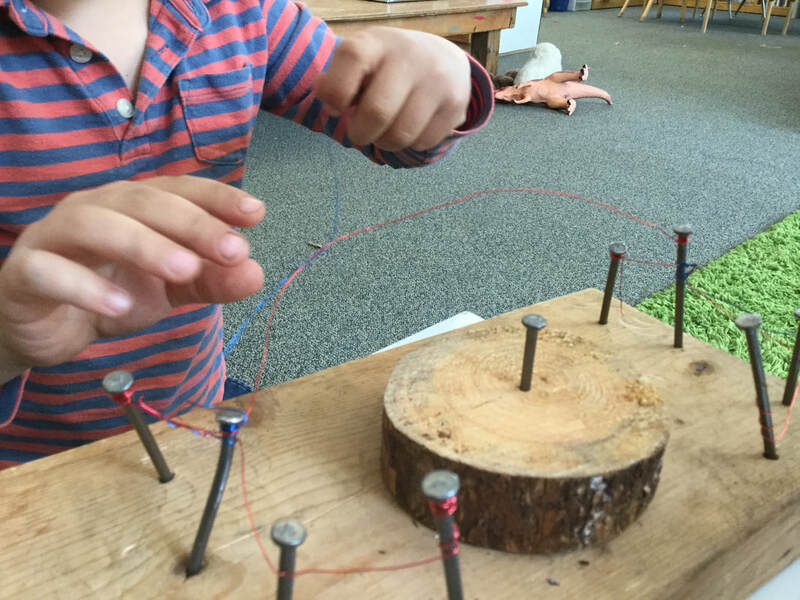 In addition to the creativity and problem solving involved, children are really using their small muscle skills as they make changes to the wire or use tools to cut and bend it. Being together and building together are often highlights of our day. Today children built on the light table with some familiar materials and some that were more novel (plastic Easter eggs). 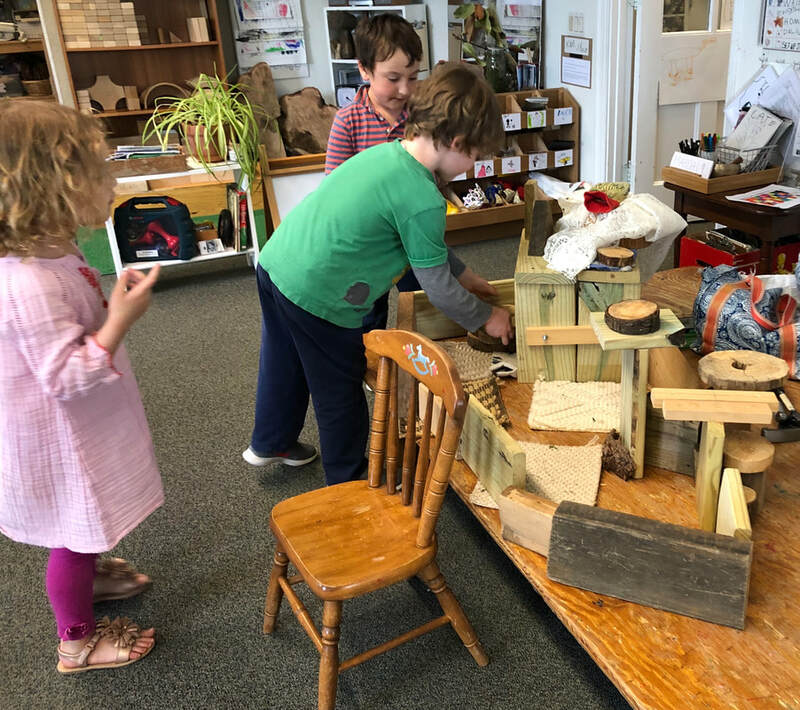 It didn't take long for children to agree that they were building a hotel, which seems to be a common construction theme for this group. After the hotel was completed, the plastic eggs became the people taking advantage of all that the hotel had to offer, including room service and a peaceful blue pool built by Lily. The group also had a fantastic time together outside on this beautiful day! Wire Group Game - children had to twist and manipulate one large piece of wire with their peers at the same time...then undo the twists, loops, and bends together bringing the wire back to one large loop. No Touch Wire and Beading - Add wire and manipulate it as you bead so that none of the beads touch one another. Meanwhile in the outdoor studio, we had a paint workshop. 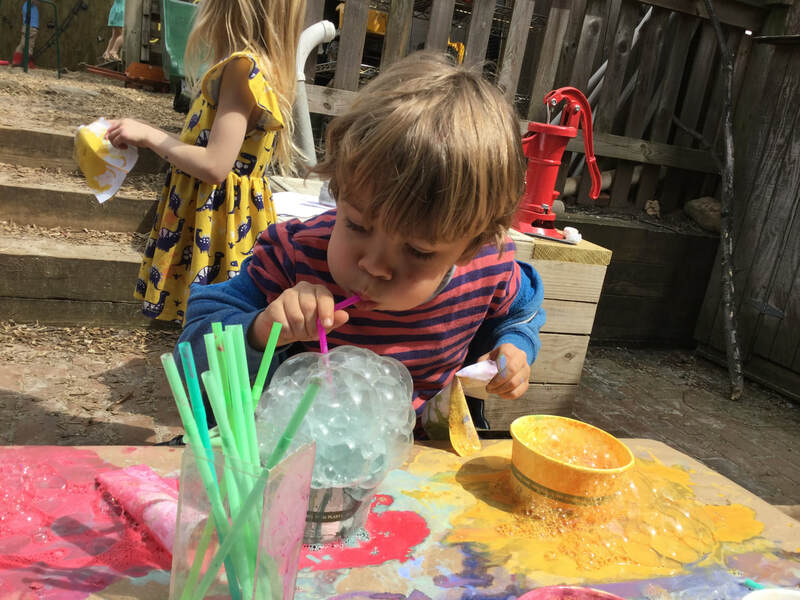 Children have been requesting for some time that we offer Bubble Printing again so we brought the fun outdoors along with exploring painting with a new and unusual tool: a squeegee! Many colorful prints were made with the bubbles and children were presented with another challenge: try and layer a few or several colors on the same paper. 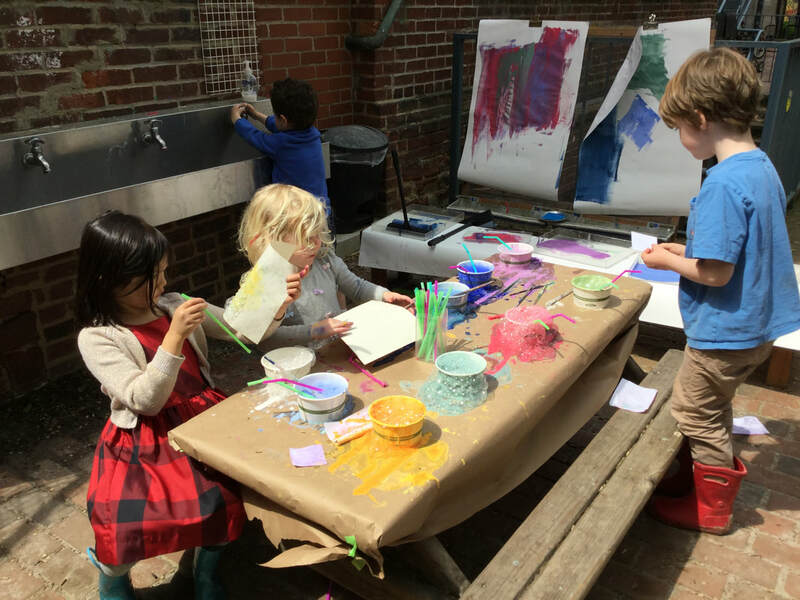 When we first began and in the times we offered the activity in the past children were sometimes hesitant to layer the colors. A similar conflict of thinking came up during yesterday’s art journal game when some did not want to add more than one “step” to a page. 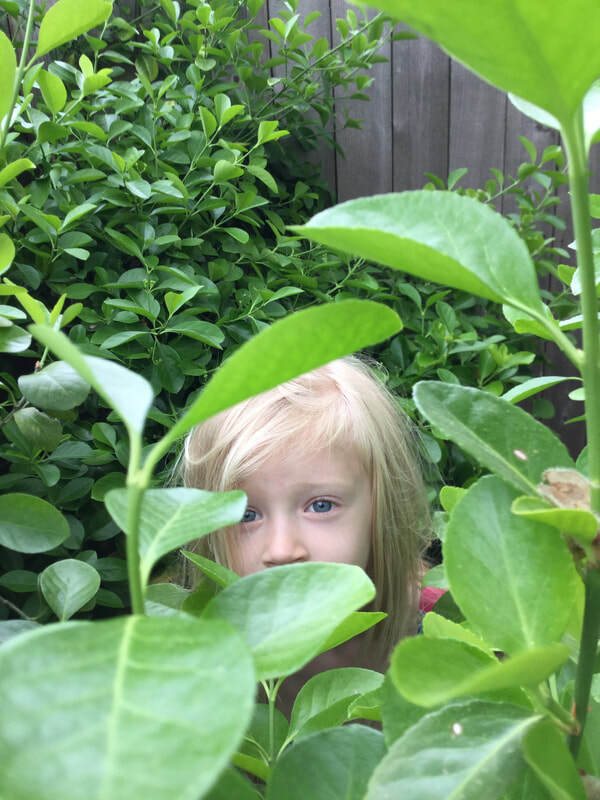 We’ve been encouraging children outside of their comfort zone with this to give layering a try in times that sometimes seem strange as the unknown result can leave us feeling unsure. As seen today, children (and adults too!) are often pleasantly surprised what can happen as we embrace the process in exploring materials and expression through the arts. 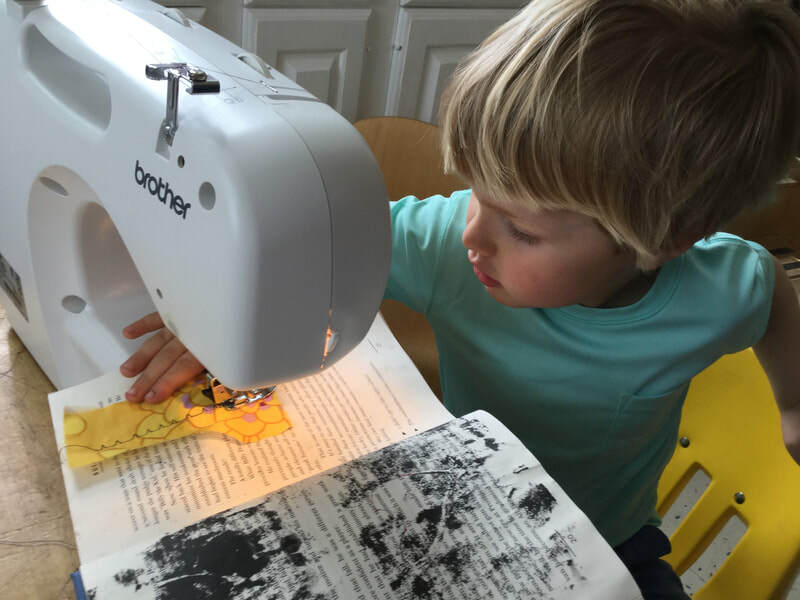 Today, Lou Lou, who had started out with one print per page, decided to take on the challenge. Before long she was layering several or all of the colors and explaining, “Look! Look at this! 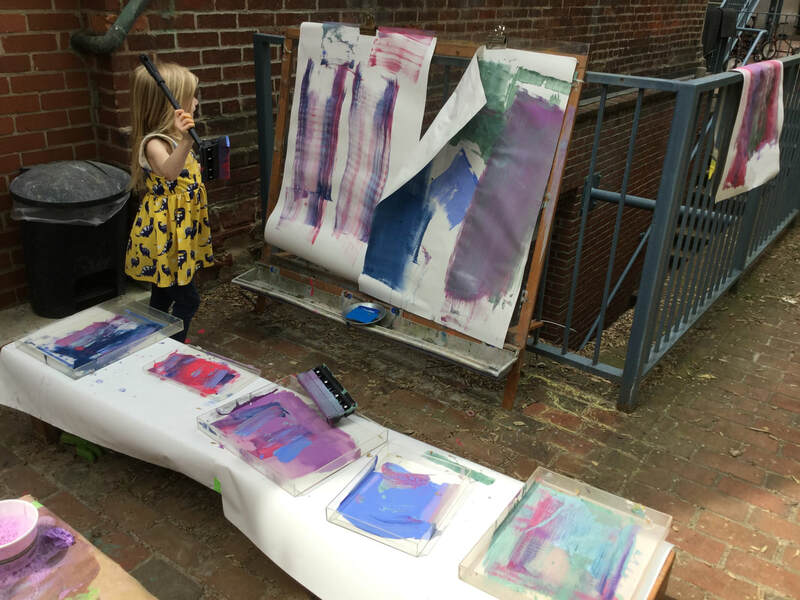 !” She appeared thrilled with the layers of colors and the ways the print changed over multiple steps. Then a surprising thing happened: children began thinking outside the box in terms of HOW to come up with the print! 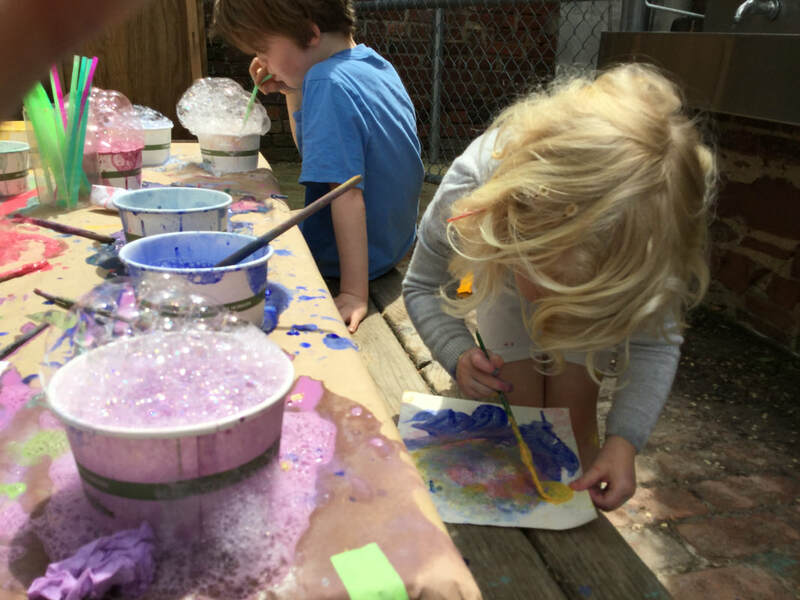 Some tried putting the paper on top of the soapy paint liquid and THEN blowing bubbles in the paint so the print would rise to meet the paper. 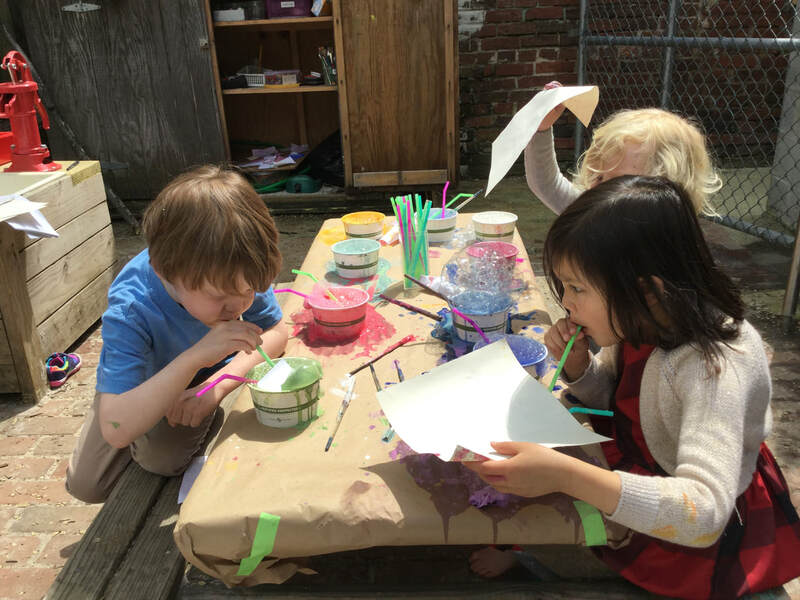 Others tried putting the paper on the table next to the bowl and blowing paint bubbles until they spilled over, falling ONTO the paper. Some even tried dipping the paper completely into the bubble liquid rather than stopping at the initial bubble print. Caleb liked scraping/popping all of the bubbles after collecting them on the paper. There were several variations along with the color-layering combinations. There was even a "bubble bridge," as James called it, where you blow bubble in two colors next to one another until the bubbles meet, creating a bridge of multicolored bubbles! Additionally, Lou Lou noticed one of her printed pages looked like a flower and she decided to paint the rest of the flower using a paint brush. Exploring painting through the use of a squeegee was interesting. James discovered the squeegee side less successful in creating large marks than the sponge side of the tool. He and several others created long scrape-like marks pulling the sponge down, up, and across the paper at the easel. 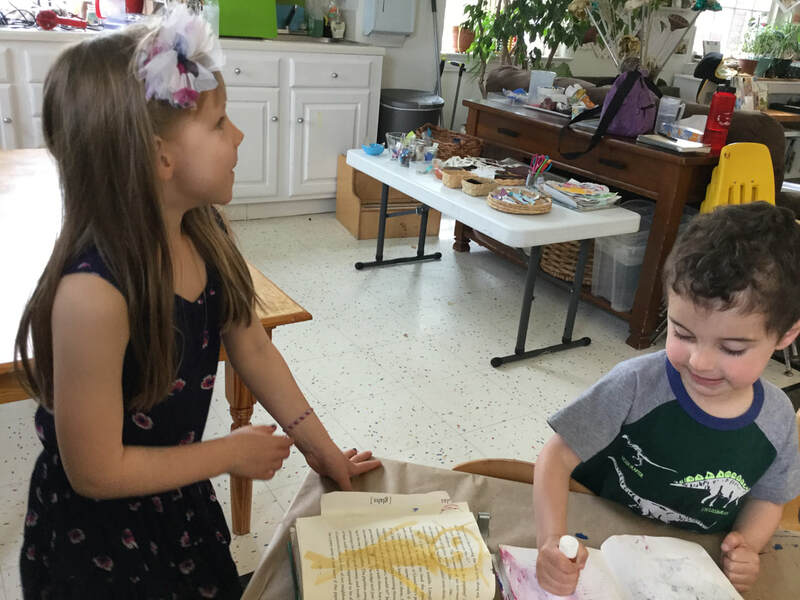 Abby, who often enjoys mixing colors in her art, figured out a way of dipping the sponge slightly in various colors then pulling it across the paper, creating a rainbow-like mark. 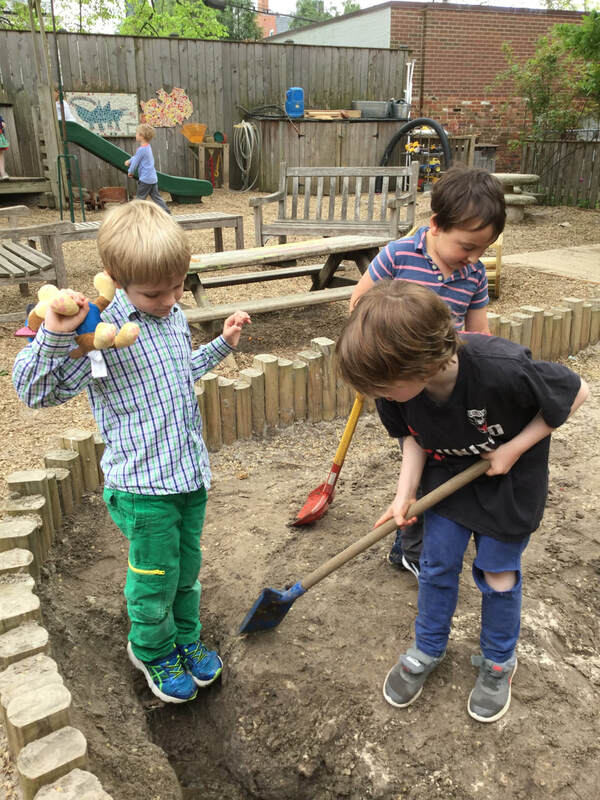 Other big-hits today were playing with Shelly’s House in the outdoor classroom, imitation-reading books together, challenge bodies in bib-body climbing/hanging/flipping/swinging, and play with water and sand. What a fabulous Outdoor Day we had together!! 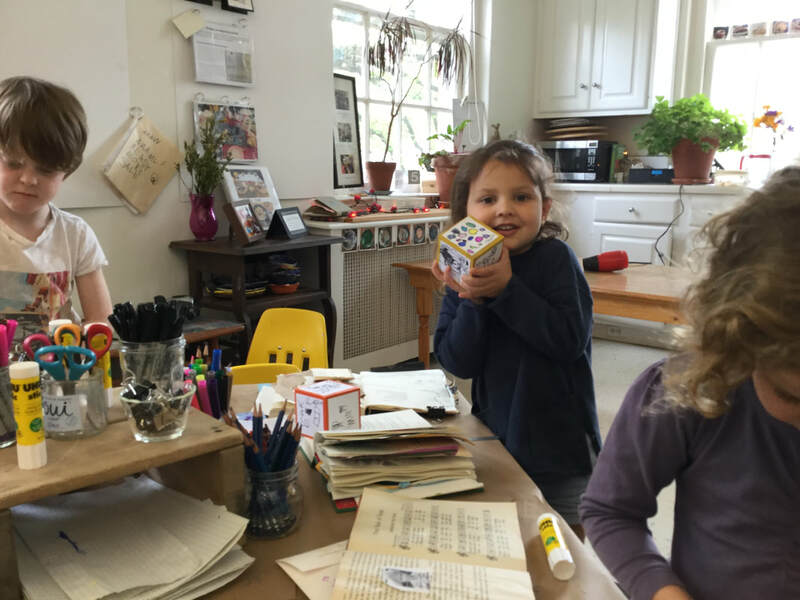 On Friday, children worked carefully to create the symbolic version of the dice game for art journaling. Today it was time to play the game with friends. The symbols were easily understood by the players. However, at times following the prompts made some children uneasy. The first roll indicated that children trace something or draw or write their feelings. 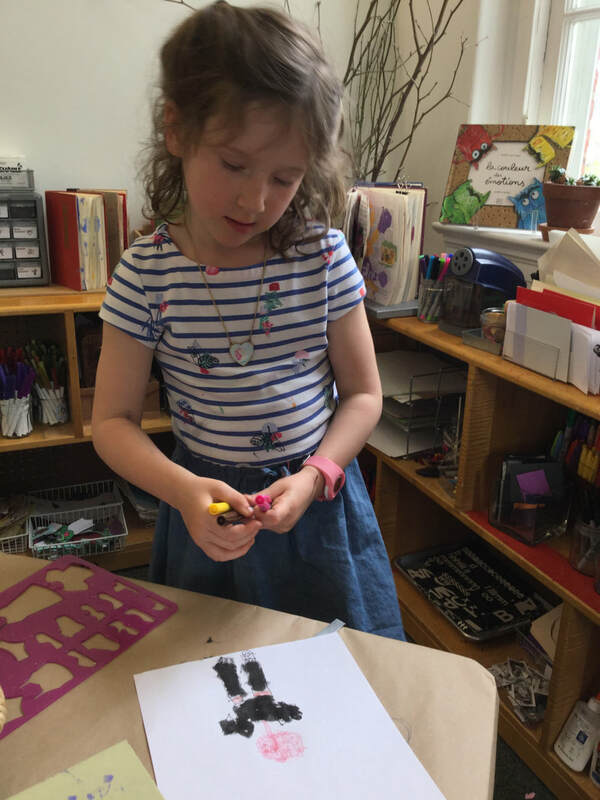 Maisie traced stenc​ils and Lily drew rain and a sad face in grey. "The rain makes me sad," she said. On the opposite page, she drew a sun and a happy face, saying, "The sun makes me happy." The second roll indicated that children should use print or glue things. Lily initially didn't want to cover up her work with paint. She thought it might ruin or obliterate her work. She and Maisie talked this through with Maisie saying, "It makes it better." Eventually, Lily felt comfortable covering something she had previously done. When the dice indicated making a print, Tommy wasn't sure he had the right materials. However, he quickly engaged in problem solving saying, "I have an idea, trace this stencil and then cut it out." The resulting solution is shown in the video below. He also noticed symmetry in his work saying, "It's like a mirror!" 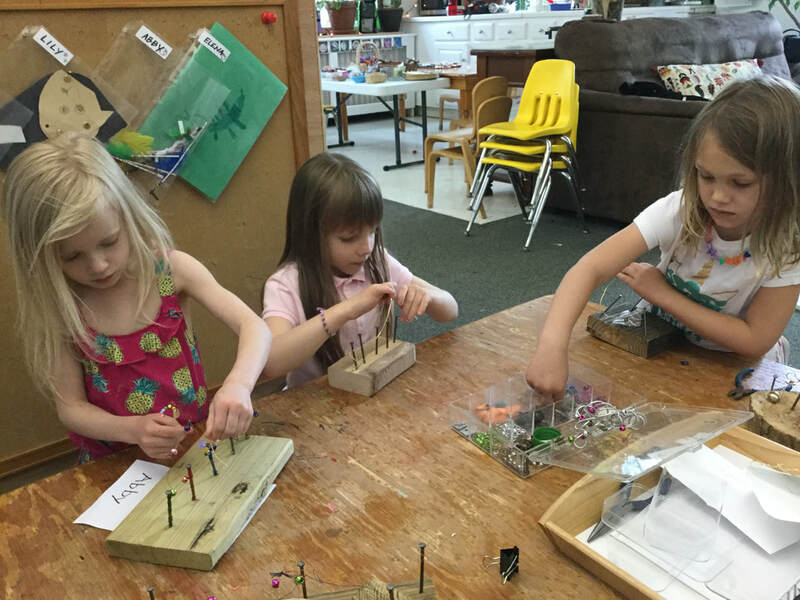 Also on Friday, children began building wooden bases for wire work. Today they were able to add the wire and a variety of materials with holes. However, in the interest of complexity, we challenged them to do "no touch wire." This requires that after each bead (or other material) is added, the children must manipulate the wire so that the next bead (for example) does not touch the one before it, The wire can be bent, twisted, knotted, looped, etc.... anything that will provide space between the materials. The children eagerly took on this challenge! Some of the work is displayed in the hallway and more will be coming soon. Cate - This is not a room. This is a place for seal to jump on. Caleb - And that (block tower) is the place for the electricity. Hugh - We have three big rooms and one small room. The small room is for Cate's seal. Elena - This is a hotel where they can eat. Dagny - That's beautiful, Elena. Hugh - Yeah, it is. Elena - It's a special hotel. It's special because you can float around on boats. Dagny - These are teeny rooms. They're toy storing rooms. At times, it seemed like the biggest challenge would be to build a room big enough for Sam's dinosaur. There were times the dinosaur tried to enter a room, only to have the walls or doorway crash. Eventually, children decided using the entire light table would provide enough space to accommodate the dinosaur. Another Construction Challenge complete! We started out with the intention of having an outside day in KW, but the rain had other plans. 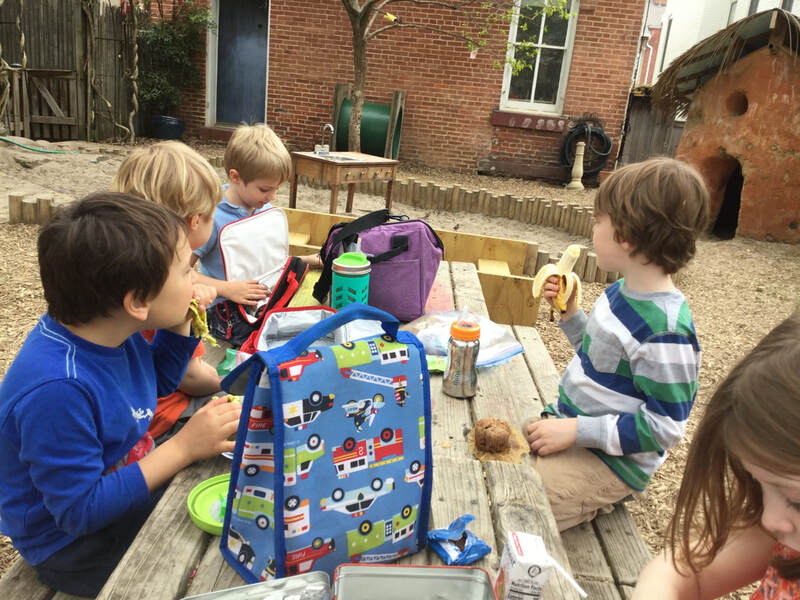 Fortunately we were able to get through most of lunch outside, enjoying a change of scenery and some fresh air before the rain began. Last week we began playing a dice game with our art journals in which the number rolled determines the step taken in your art journal. For example, if you roll a number one you put paint on your page. It became immediately apparent how dependent the children were on us adults when we played the game this way. So the idea emerged to have children design the dice game with their own drawings and words so they can "read" the game independently. Today we began working on this idea with a cube block and some paper. 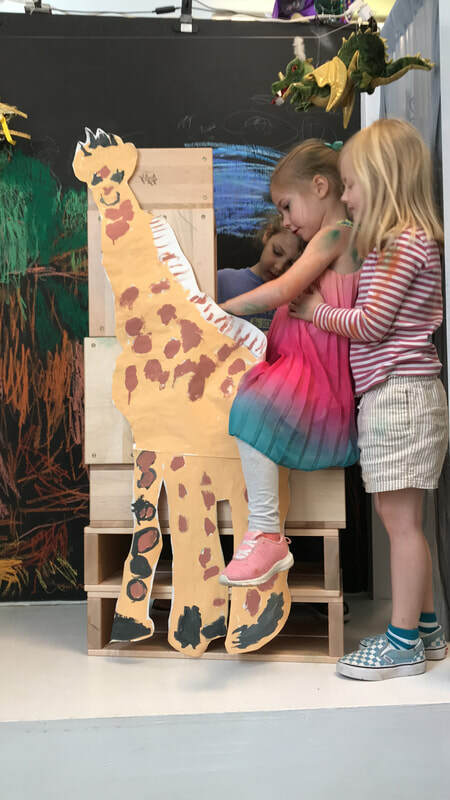 The children agreed to continue with the same steps previously decided on: paint, tear paper and glue it down, draw something, add a picture (image), make a print, and trace or make marks. Using abstract and symbolic thinking is a challenge when deciding how to portray an idea everyone can understand. 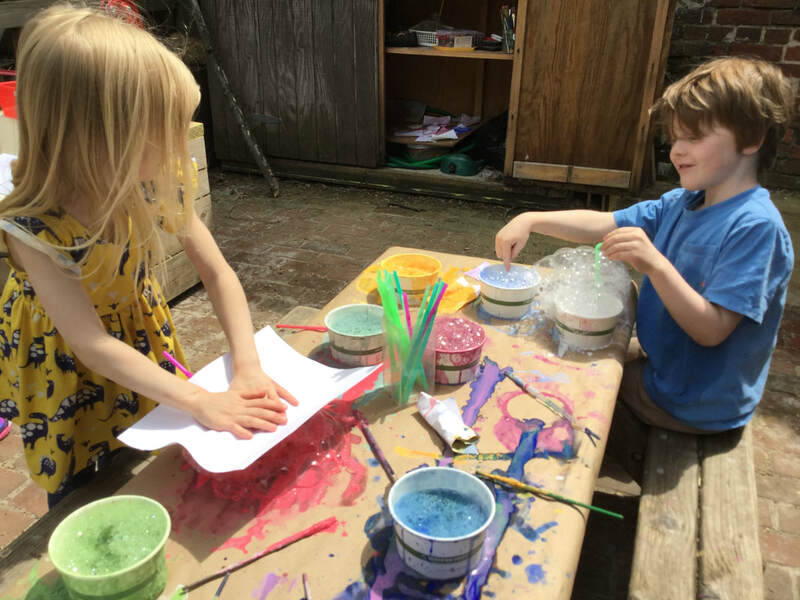 The first choices seemed fairly simple for the children: paint and draw, but as we continued with the abstract concepts, we all had to really think about how to show the ideas. We worked together to talk about what it is we are doing during these journal steps. Such as "draw" which seemed easy enough, Tommy drew a book with colored marks on the pages and Cate drew a marker. It was decided that the two ideas could be combined into one as how could you decipher the drawing of a book from adding paint to the page? Tommy also came up with a clever idea of how to portray "print." Using a few images and arrows he showed how you can put paint on one side of a page, press the pages together, and end up with a mirror-image print on both pages. Another concept we had to wrestle with, and one we have been discussing since coming up with journal steps and prompts, is open-ended ideas. Cate and Lily wanted to draw Hatchimals and specific animals as those are the things they would want to draw in their journals. 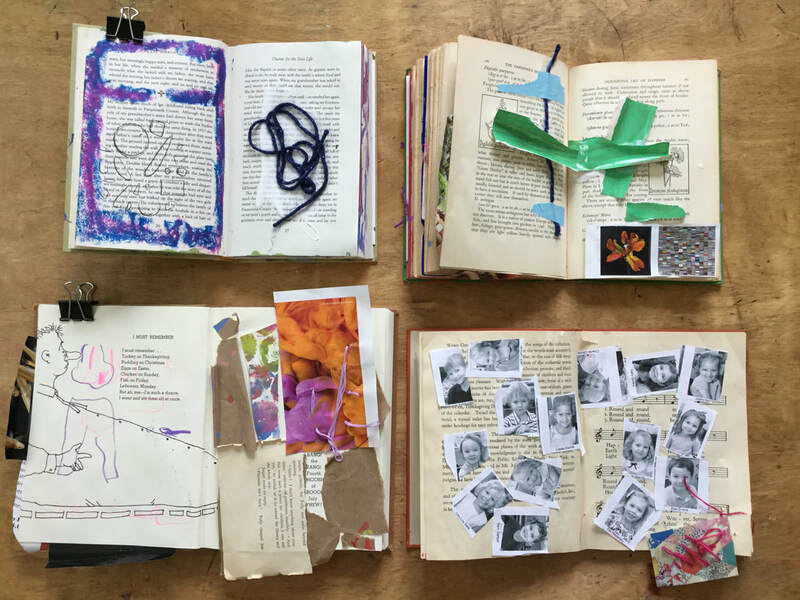 So Cate started by drawing several drawings to represent images that could be collaged into the journal. Cate appeared to have gained confidence in representing the abstract concept and then quickly knew how she could represent a torn piece of paper for the next side of the die. 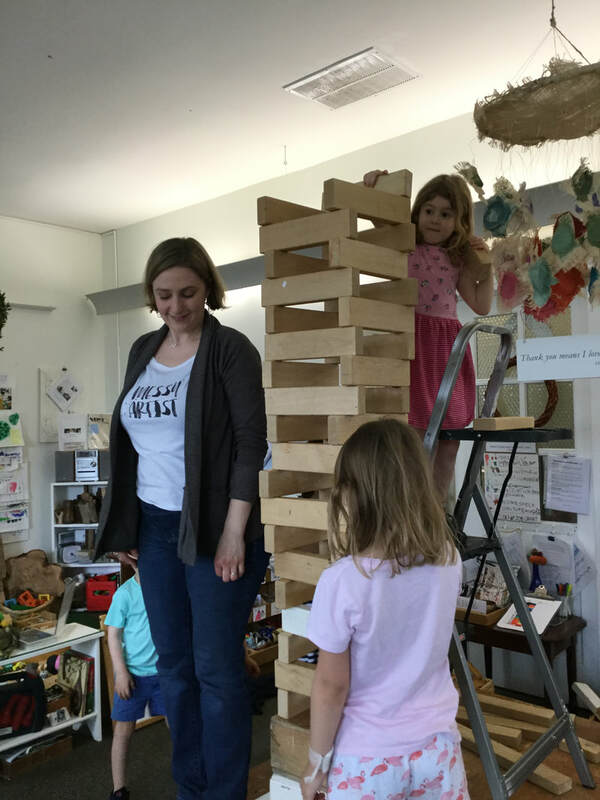 As the children started to get their ideas flowing, they began coming up with more steps than the six sides the block would allow. At this point Tommy became determined on filling two blocks: "Eleven because six plus six is...(he paused as if adding in his mind) eleven, yeah, eleven." A second block was brought in. The children added the ideas they knew off the top of their head and then we began reflecting on what other steps have we taken in our journals. We even had to do some research looking into our friends' journals for other ideas to add. We then had to debate the range of open-ended ideas such as when Lily asked for clarification on why we might not have the step "draw a tiger" but we might add "write or draw your favorite thing," (suggested by James.) Lily pointed out that we already had "draw something." So we decided to make it "write," but when it came to Tommy wanting to add a prompt about feelings, it was decided to make it "write or draw how you feel." A few other concepts we worked with in coming up with the designs for our dice game were new vocabulary, literacy in writing and noticing similarities between words, ("Print and paint are almost the same," said Lily,) math, and ways of working together collaboratively. Creating the game brought up some inspiration as well such as when Tommy was looking through Hugh's journal and saw the flaps Hugh had added. 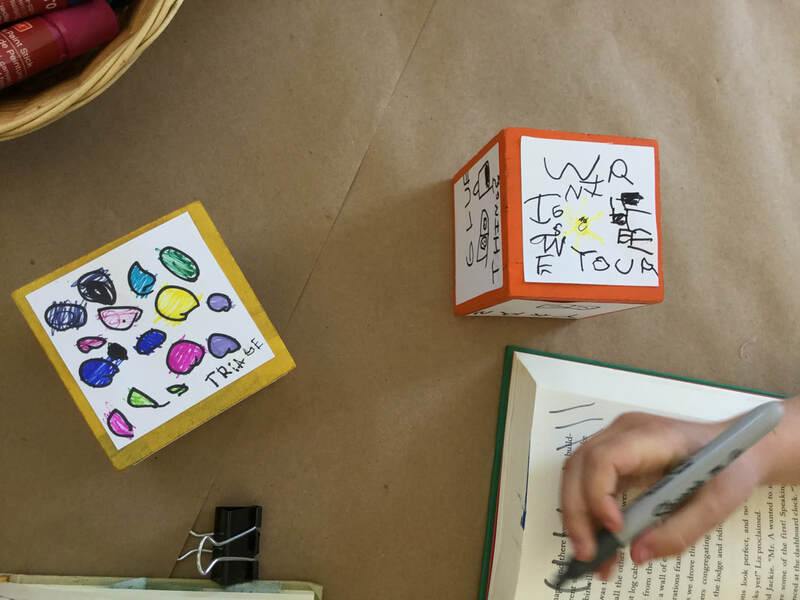 Tommy decided we had to add this to the dice and, as he created the design to represent the idea, he said, "I want to add flaps to my journal." It seems the dice are already working for us and we can't wait to really play with them next week! As we've been mentioning, our explorations in various workshops tends to loop around and layer the knowledge gained from each language onto one another. So as we've been discussing and thinking about where we're going in our wood workshop it becomes natural to think about combining wood with wire and beads (a workshop we've yet to do with two we've already worked with.) Today the children began building bases to combine these languages and possibly others as we go. As you can see in some of the notes from the experience, children bring along what is already known and test it in this experience. Abby also became so engaged with her work that she continued forward in including the wire and beads! When she was finished she proudly showed her work to the rest of the group. Also today, children had the opportunity to build together at the light table. Through this experience and others, the children were eager and content to take moments of simply being together. 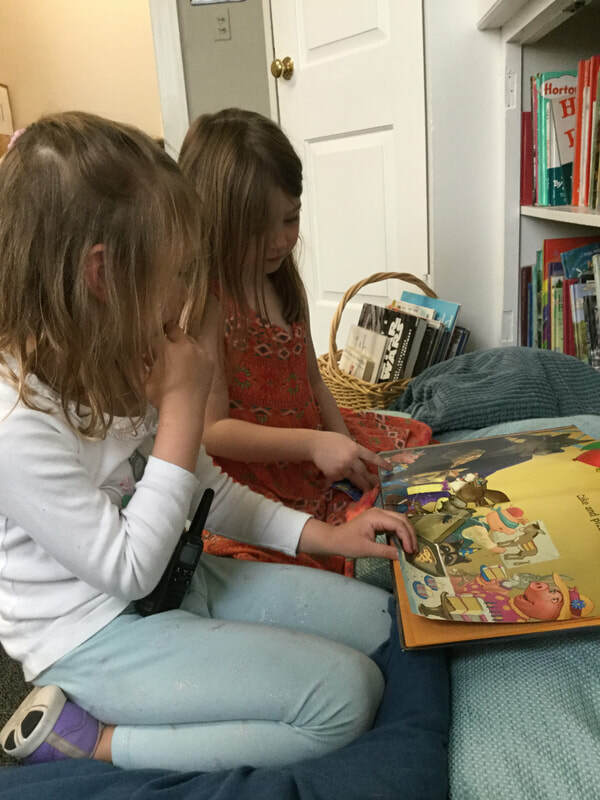 One example is Lily and Cate who are seen below reading together and making a plan for the walkie talkies they will try communicating through over the weekend. We hope your weekend is fabulous and filled with moments like these of being with one another. See you next week! Grace - I think Shelly's house needs a rainbow on the roof. Tommy - We could get rainbow-shaped wood and paint it. Although Jessica M. wasn't feeling well today, we were thrilled to have Jessica Kuhn working with us. 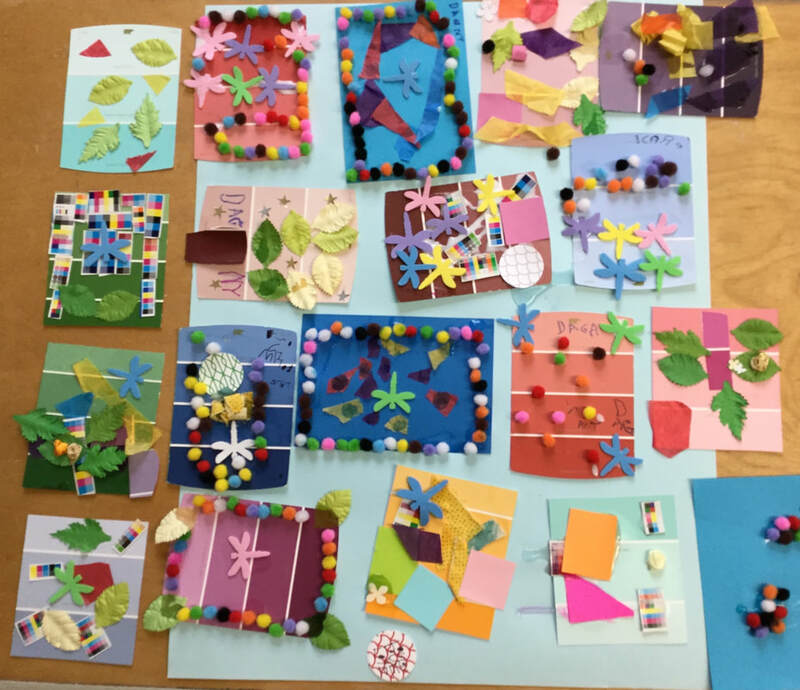 With her support (and frequent trips to the Tucker closet), children worked on small collages featuring bright spring colors. Children choose to add these to their art journals, the collages are just the right size. Children were encouraged to layer various papers and materials as they made their creations. 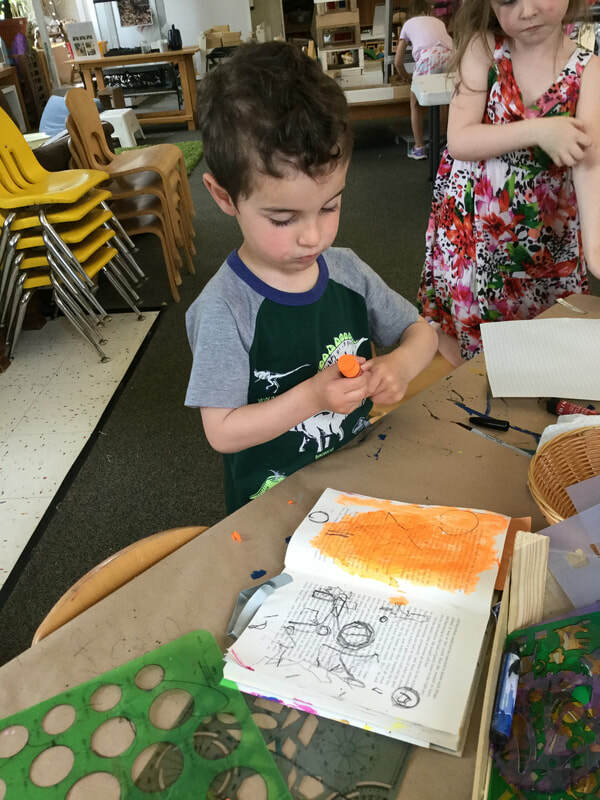 While it will be easier to add a mostly flat collage to the art journals, many children had a hard time resisting the brightly colored mini-pom-poms they found on the shelf! After making many collages, some children used these materials to make messages. Several friends will be surprised when they check their mailboxes in the coming days! Last , but certainly not least, it was a great day to spend time with friends. KW also provides an opportunity for children to interact with someone they may not have even seen during the morning. 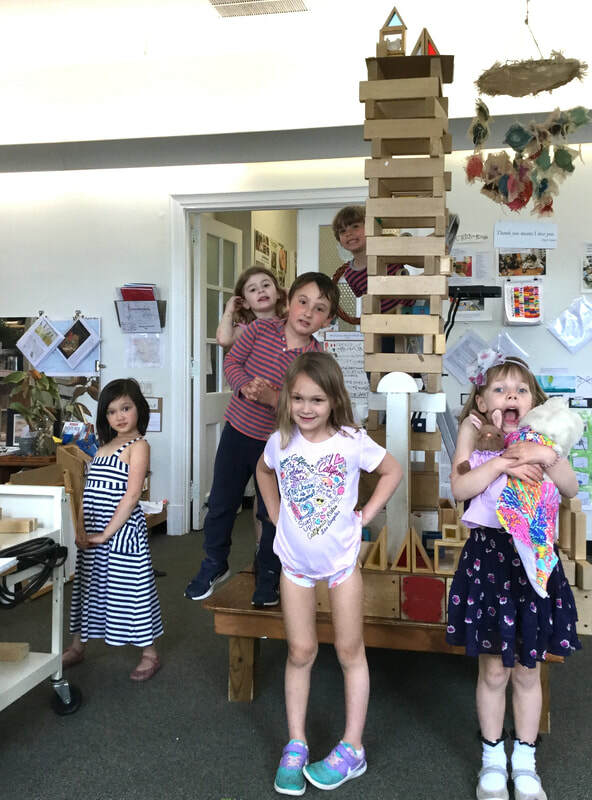 Today we read a funny story, saw children build together outside and inside, witnessed children challenging themselves on the climbing wall, and played some wild and wonderful Zingo games! Thanks to all who attended classroom stories last night. The video is posted just below this blog post! Thank you so much for joining us for Classroom Stories last night! We have posted the video here for anyone who didn't get a chance to see it last night.... and for anyone who wants to see it again! 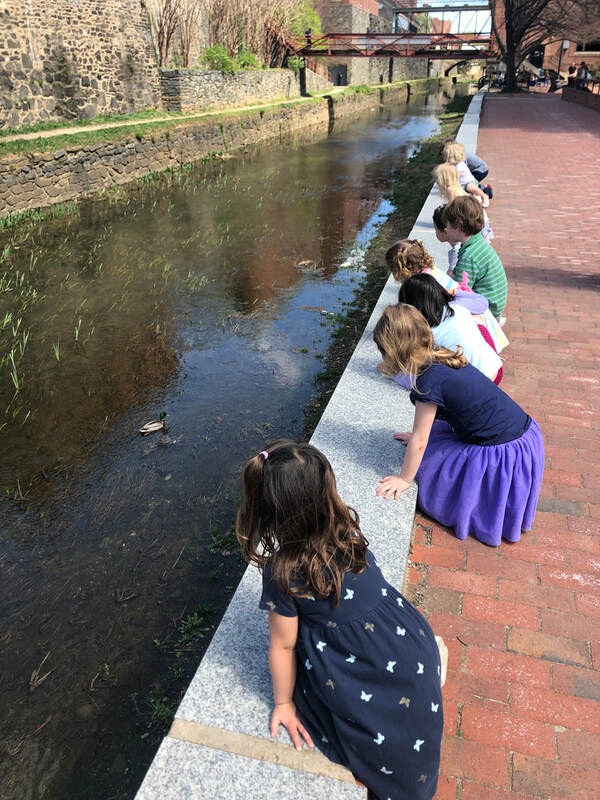 Some of our newer KW friends hadn't yet been to the canal to see the ducks so we planned a field trip to visit the canal. It being spring, we wondered if there would be any ducklings yet. So we went in search of ducks and ducklings. We were surprised to see only two lone male Mallards until the very end of our walk when we saw six ducks together; one female, five male and no duckling Mallards. Despite our limited finds, we were able to observe and feed the ducks. We stopped for a short while to draw in our art journals. 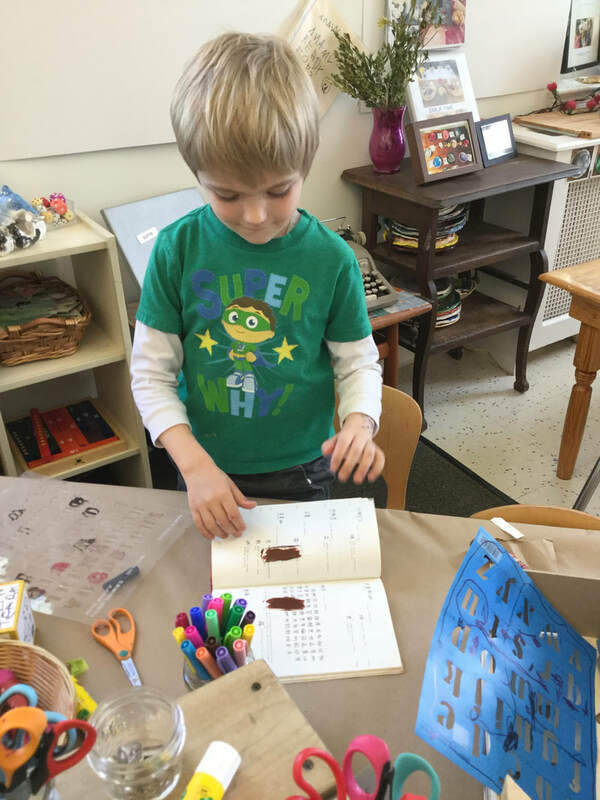 In their journals, some drew flowers from nearby planters, others drew canal scenes, James circled and marked familiar words on the pages, and Caleb made a green page. One thing we have been noticing since we have been challenging the children with prompts for their journals or discussing what they have and plan to make, is an increase in intentional pages in their journals. For instance, the children come to their books eager and with a plan they often articulate verbally such as Caleb today who sat down and said, "I'm going to make a green page." He then worked in only green, drawing and creating on his page. Perhaps he was inspired by all of the green seen along the canal! 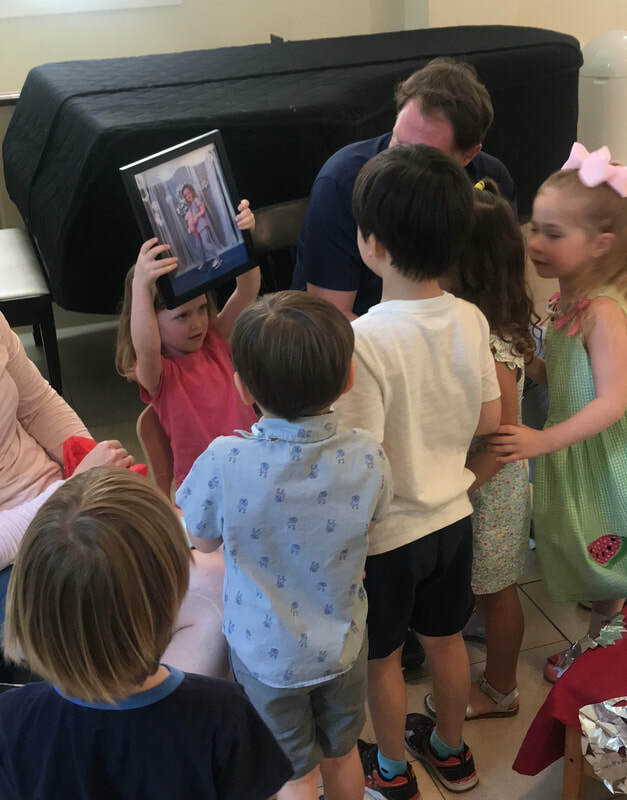 We hope you enjoy these photos and we'll see you soon for Classroom Stories Night where we look forward to sharing our KW slideshow with you starting at 6:30 PM. Sam - I was thinking about shapes. Tommy - I made a portrait of Bella (a pet) so I remember. Sam - (Using paint sticks on several pages) It's really pretty. Hugh - We might be building taller than a teacher. Caleb - Yeah, let's do it! Cate - Up to the ceiling. Caleb - Yeah, that's the challenge, but we can do that. Wait. we're not tall enough. Cate - Or you might need one taller than you can reach. Tommy - Remember in Rainey Room when we made a structure taller than Allison? Caleb - The Eiffel Tower. Several children - Oh, yeah, I remember that. Elena - It's a sky scraper. Sky scrapers are big. Caleb - It could be a lightening obsorber. Tommy - Its' as tall as the Eiffel Tower. Elena - ( Adding colored blocks and stained glass blocks) We need lots and lots of blocks to make it prettier and prettier. Lily - It's taller than the ladder. Caleb - And we made a huge garage. Cate - (Coming over from the art journal table) How in the world did you do that? Elena - We used a ladder, but we builded so stable that it didn't fall. Tommy - It's almost as big as the Tucker Room. 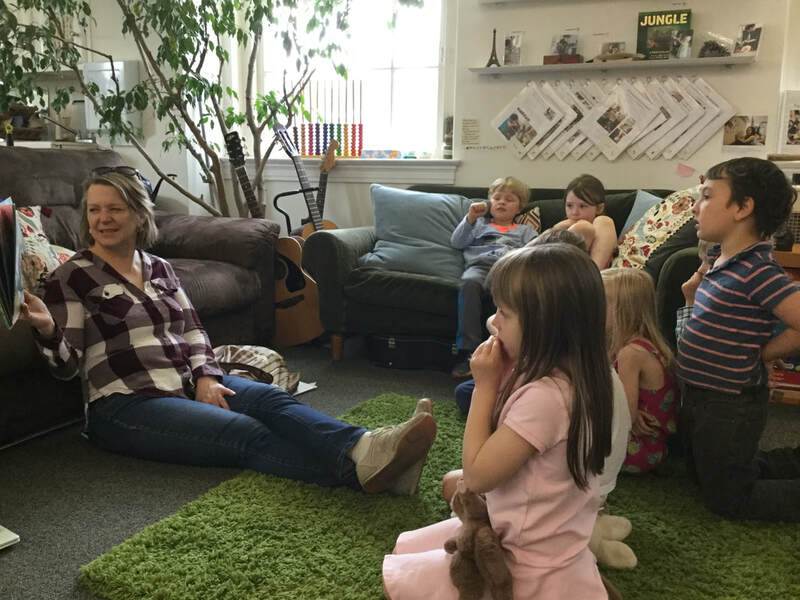 We are looking forward to spending time with families at tomorrow night's Classroom Stories evening. In preparation, children made a white bean avocado dip to snack on while viewing the slide show. We hope to see you then. In the meantime, enjoy these images! Today we delivered our thank you card, which is actually a book, to The Lantern bookshop. The volunteers at the shop were so delighted to see us and the book we made them as a thank you for their kindness on recent field trips. We remembered how nice they have been on our visits, the way they gave us two bags of books to use in our work, and how they read to us. Today's volunteers wrote in their daily record so the other volunteers would know about our visit and the thank you card-book we gave them. 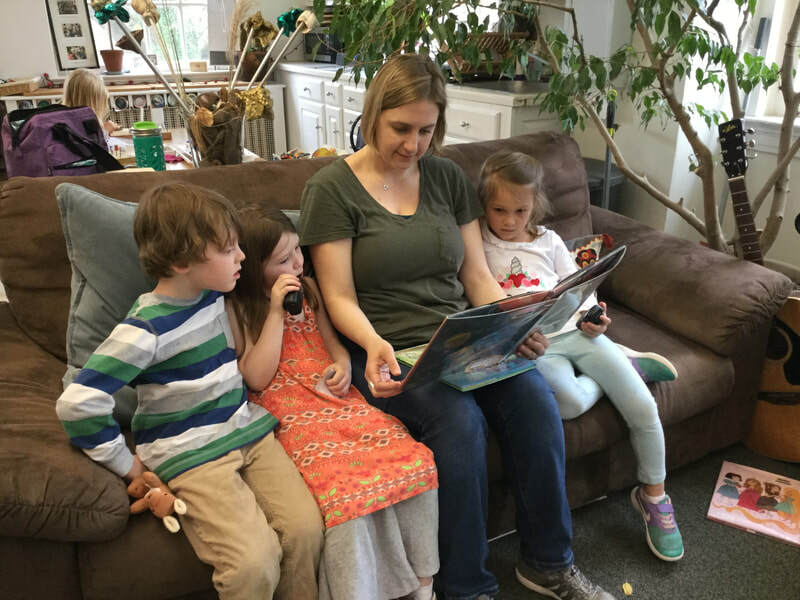 The children were so happy to be in the space, that they voted to forgo today's planned activities in lieu of viewing and listening to the books at the shop. 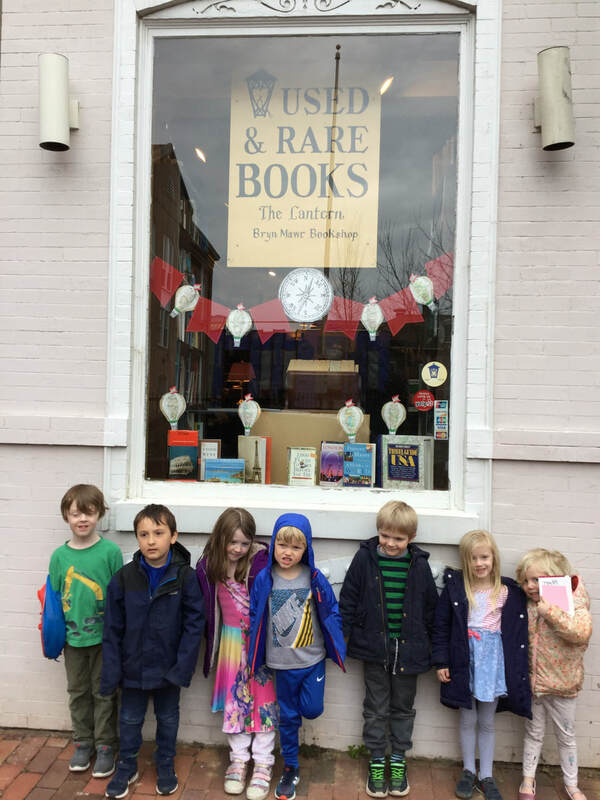 We had a delightful time cozied up together in the children's window nook reading Swan Lake, David Goes to School, and other mysterious and funny tales. Enjoy the photos and have a fabulous weekend! 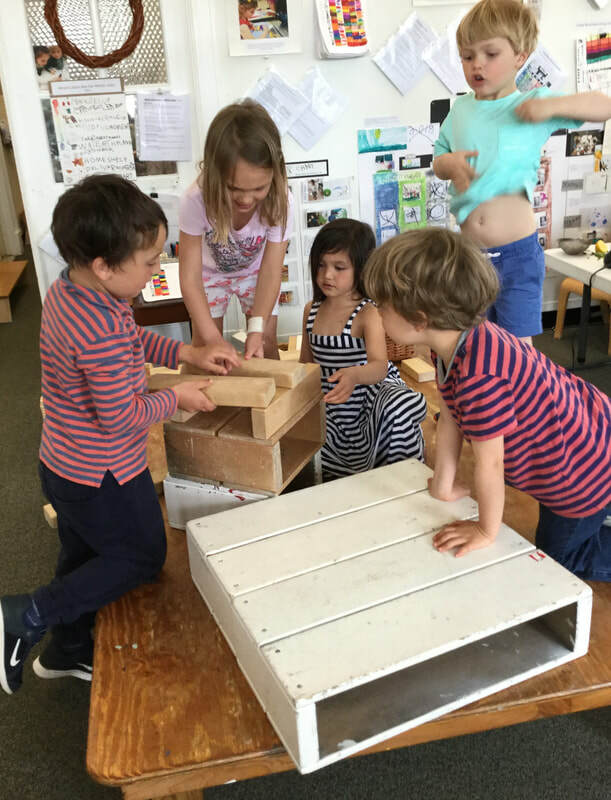 Welcome to the Kids’ Workshop blog homepage!